Eat a Shake, Drink a Cake. 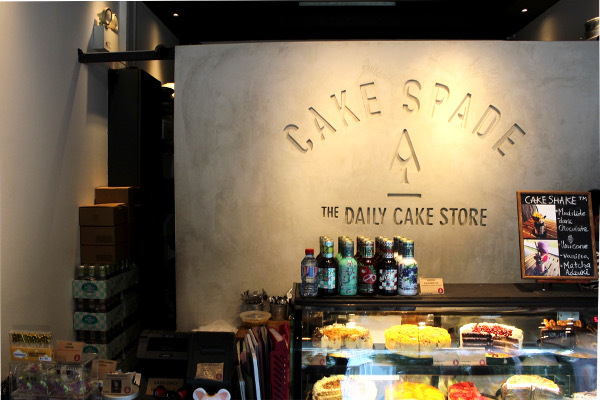 Cake Spade occupies a mere 300 square feet (approximate) of space at Orchid Hotel amongst the many F&B establishments in the Tanjong Pagar area and yet its hard to miss with constant crowd surrounding this cosy café/bakery. Almost 2 years since its entry, Cake Spade has maintained a great consistency with its handcrafted cakes and tarts. 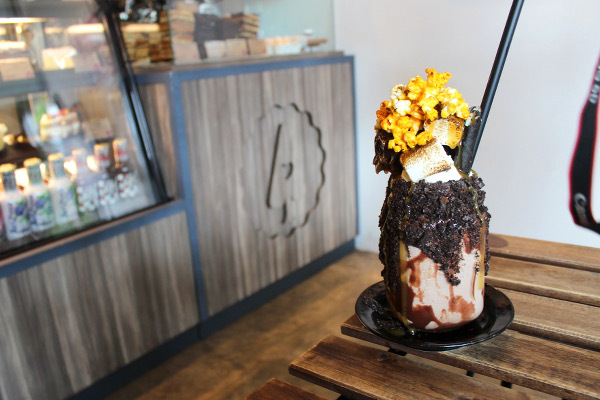 The elegant & soft spoken owner Zenn Eng is making all dessert lovers go ga-ga with their latest fancy milkshake addition. 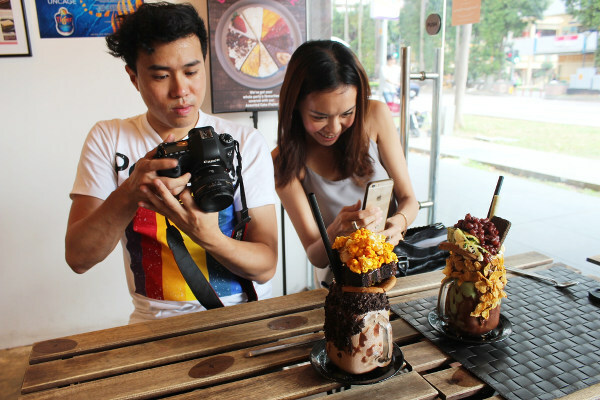 Known as Cake shakes, it is essentially an ice-cream milkshake with a beautiful composition of delectable sweet treats that is so visually stunning and instagram-worthy, many have flocked here just for the shake. Definitely a brilliant marketing strategy to entice new customers and retain existing ones. 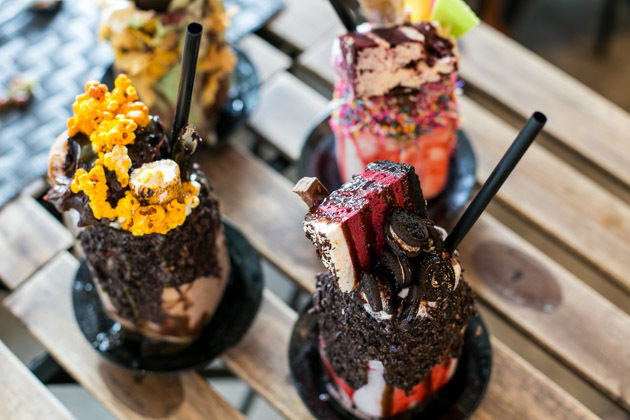 Since every Cake shake is like an art piece that is painstackingly (pun intended) constructed upon each order, please expect a 10 -15 minutes wait per order. Each serving is good to share with 2-3 friends as its so rich and heavy. A splash of cheery yellow salted caramel popcorn greeted us as it balanced precariously on top of the black out cake and roasted marshmallows. The outer glass of the mug has Nutella carelessly spread across before crushed oreos bits decorate the mug. The ice cold bitter chocolate milk shake can be seen with swirls of chocolate fudge through the glass mug. It is finally drizzled with caramel sauce that gives it a golden brown sheen when placed against the sunlight. Breathtaking sight indeed. The bitter chocolate milk shake wasn’t as dark as we expected and more on the lighter side – like chocolate milk. Perhaps the intention is to balance out the overall sweetness level but the flavour is muted and felt like a movie with an abrupt ending after an impressive opening. 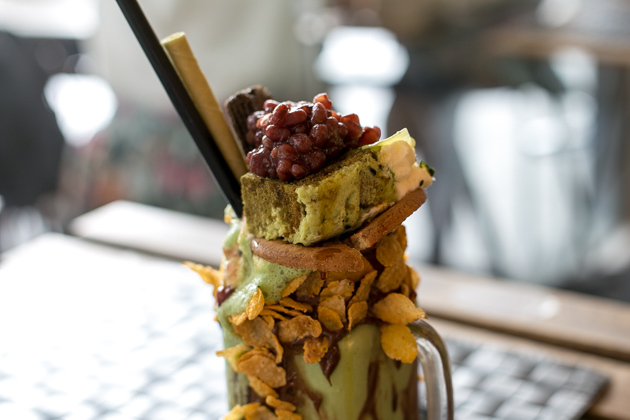 Next came the matcha adzuki with a slice of matcha goma cake and a generous dollop of azuki red beans stacked on top of the ice-cream matcha shake with a dash of whipped cream, matcha wafer sticks before golden cornflakes rimmed the mug. Clever idea to use Nutella as an edible ‘glue’ since it goes well with almost anything. The colours blend so well making the soothing green absolutely inviting. Its probably psychological but knowing the healthy benefits that green tea and sesame seems to justify having one more cake shake. The matcha goma cake is soft and light with a hint of earthy green and aromatic sesame. Combined that with chewy red bean and crunchy corn flakes, this is the moment when textures and flavours merge into one harmonious note in your mouth. The mildly sweet matcha ice cream shake is light with a hint of bitterness from the matcha that transforms this cake shake from a heavy calories laden dessert to a “I cant stop eating, drinking, licking” it up kind of healthy sweet treat. Delusional? Yes. Delicious? Yes to that too! A good old fashion vanilla ice-cream shake topped with a slice of the popular red velvet cake with cream cheese, coloured biscuit pieces before rainbow sprinkles are dusted onto the mug with Nutella. It is finally decorated with an ice-cream cone of pink candy floss. A pretty sight of pink and all things happy, this cakeshake reminds me of the enchanted garden filled with “my little ponys” and unicorns. I believe this is the intention hence the aptly titled cakeshake. Red velvet cake has never been one of my favourites at Cake Spade as I felt it is too dense with very faint cocoa flavour. The little biscuits (known as piring piring) evoke nostalgic childhood memories for me but its better for decorative purposes since it turns soggy real quick in the whipped cream and shake. Although it remains icy cold despite a slight pandemonium to take more pretty pink pictures, the vanilla ice cream shake wasn’t very rich nor very creamy. Kind of 1 dimensional and gets boring after a while. This is the latest addition to the Cake shake menu. 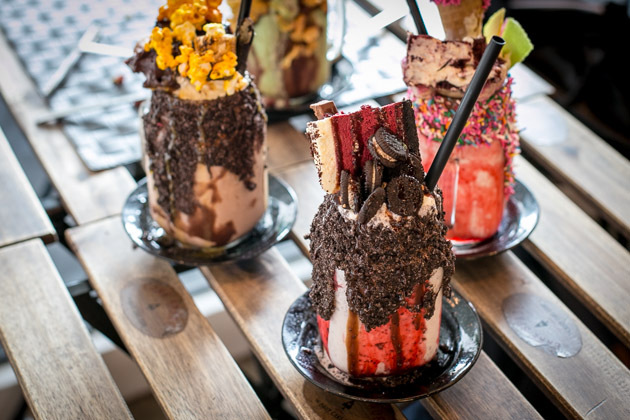 The oreo ice-cream milk shake with swirls of strawberry sauce fills the mug before extra mini oreo cookies are stacked on the top with a slice of red velvet cheese cake and a Kit Kat. Crushed oreo bits are coated on the outer layer of the mug. This red velvet cheese cake has to be my new favourite Cake Spade cake. It is not easy to find a good red velvet cake and I like this version. Layers of red coloured cheese cake sandwiched with chocolate cream that is soft yet dense, chocolatey yet light. Note that this cake is different from the red velvet cake in the Unicone cakeshake. The oreo ice-cream milk shake is creamy and smooth with chewy oreo bits. Definitely a must-try for Oreo lovers. 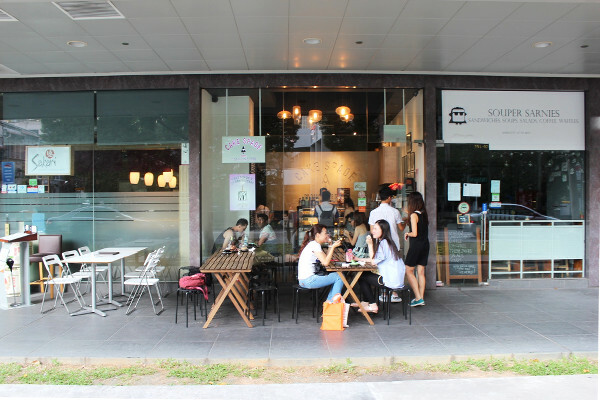 The cafe-owner Zenn Eng explained that they are still tweaking the combination and may change the outer glacing to S’mores. I would certainly prefer to have S’more to break the monotony of having more oreos. Cake Spade lives up to its reputation of creating quality cakes and tarts. 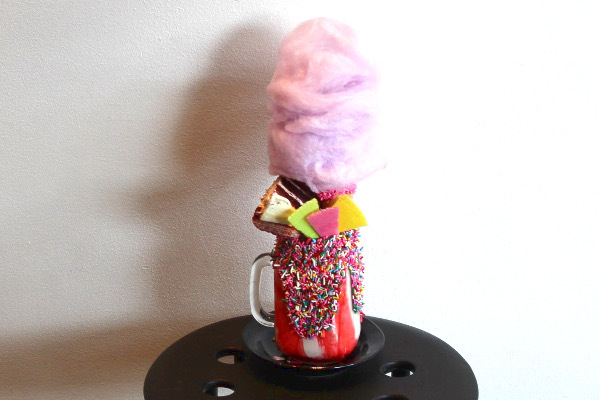 This new addition “Cakeshakes” have made eating desserts both drinkable and interactive. So now you know another great place to bring a date or gather with friends. 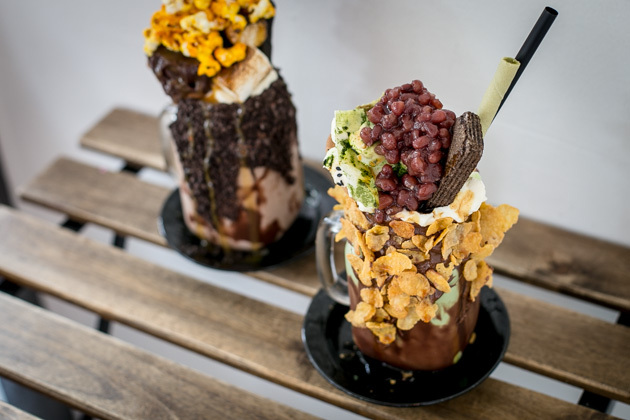 Have fun deconstructing the toppings and sharing a ice cold milkshake perfect in our tropical climate. Even when this milkshake wave dies down, you can relook at the pictures, relive the memories and reunite for a slice of their delicious cakes. *Cakeshakes are available Monday to Friday after 5pm and Saturday from 130pm onwards.